The Trans Canada Trail, commonly known as “The Great Trail”, began in 1992 during the Canada 125 celebrations, and full nation-wide connection was achieved during the Canada 150 celebrations in 2017. The Great Trail is made up of hundreds of individual trails linked together to form over 24,000 kilometres of multi-use trail connecting Canada from coast to coast to coast. The Great Trail passes through every province and territory, connects approximately 15,000 communities, and is recognized as the longest recreational trail in the world. It is estimated that four out of five Canadians live within 30 minutes of the trail. The Great Trail is a multi-use recreational trail, open to a wide variety of activities. The “big six” activities on the trail are snowmobiling, walking/hiking, cross country skiing, cycling, horseback riding, and paddling. Approximately 26% of the trail is on water, and the remainder is land based trail. Some sections are non-motorized, but the vast majority are considered true “multi-use” trails. The Great Trail achieved 100% connection nation wide in August 2017 and celebrations were held across the country. Although The Great Trail is now connected, work will continue for many years as volunteer groups across the country maintain, upgrade and improve The Great Trail. There is a national Trans Canada Trail organization based in Montreal and they promote, assist and oversee development of The Great Trail. They have also selected suitable territorial and provincial organizations to act on their behalf as official agents in each territory and province, and a letter of agreement was signed outlining the responsibilities of each party. For the Yukon Territory, the Klondike Snowmobile Association proudly serves this role. There are national guidelines and standards to be followed, and some limited funding is available for construction and maintenance of the trail. The Great Trail is very much a community volunteer based project however, and the vast majority of the trail building and maintenance is accomplished by local volunteers. The territorial and provincial agents are responsible for leading the designation, building and maintenance of the trail in their area, and any local groups wishing to apply for recognition, assistance or funding must apply through the provincial/territorial agent. It is also up to those agents to ensure the standards of the Trans Canada Trail are met in their area. This system has created a national trail system that has consistent signage and standards nation-wide, but is still completely unique in each area. Although snowmobiling is one of the “Big Six” core groups on The Great Trail, the Canadian Council of Snowmobile Organizations (C.C.S.O.) realized early on that the proposed route of the Trans Canada Trail would not make a true Trans Canada Snowmobile Trail (T.C.S.T. ), due to its southern track across most of Canada. Therefore, in 1993 the C.C.S.O. decided to link existing provincial and territorial snowmobile trails into a true cross Canada snowmobile network. The T.C.S.T. was fully linked by 1998, and was North America’s first coast to coast recreational trail. In March of 1996 the Klondike Snowmobile Association scooped the rest of Canada by having the president of the C.C.S.O. come to the Yukon and open the first official section of T.C.S.T. in Canada, The Top of the World Highway, closed in winter and used by hundreds of snowmobilers during the Trek Over the Top. It generated an impressive amount of media exposure for the Yukon. To open the completed T.C.S.T. in 1998, the C.C.S.O. rode coast to coast in RendezVous 1998. As in numerous jurisdictions across Canada, combining the two national trail systems in the Yukon makes economic and environmental sense. Most snowmobile trails can easily be shared with skiers and dog teams during winter, and have potential to make great hike & bike trails come summer. Based on this, the Klondike Snowmobile Association sought and obtained official agent status with the Trans Canada Trail Foundation. Since then Klondike Snowmobile Association volunteers have been working hard year-round to build, designate, connect and maintain the The Great Trail in the Yukon. In early 2016 the K.S.A. and the Trans Canada Trail celebrated 100% connection of the Yukon portion of The Great Trail, the third province/territory to do so. The Klondike Snowmobile Association is now looking forward to a long future of continuing to work with the Trans Canada Trail as we continue to maintain, upgrade and improve various sections of The Great Trail throughout the Yukon. The Trans Canada Trail and the Klondike Snowmobile Association strongly believe in the Multi Use Trail concept. Snowmobilers, mushers, skiiers, ATVers, hikers, bikers, horseback riders, walkers, runners, and everyone in between are all considered a welcome sight on the trail. With the Yukon’s beautiful scenery and abundance of historical trails, The Great Trail concept has been tremendously popular among Yukoners, and the potential for expanded tourism is real. There is a wide variety of individual trails that make up The Great Trail in the Yukon, and each of these unique trails has been linked together to form over 1,600 km of continuous multi-use trail. The Yukon portion of The Great Trail connects to the British Columbia portion at the Yukon/B.C. border south of Watson Lake and to the Northwest Territories portion at the Yukon/N.W.T. border on the Dempster Highway. By making these connections, the Yukon portion of The Great Trail has become a key section of the national trail system by making a true coast to coast to coast route possible. The Yukon section of The Great Trail starts on the famous Alaska Highway at the Yukon/B.C. border. The highway was constructed in 1942 by the United States Army (with permission from the Canadian government) as the ALCAN Highway (Alaska-Canada Highway) from Dawson Creek, B.C. to Fairbanks, Alaska, to move troops and supplies to Alaska during World War 2. The highway was constructed through over 2000 km of remote wilderness, through five mountain ranges and across countless rivers and creeks. Amazingly, the job was accomplished in only eight months. After the war the highway was handed over to the Canadian governments who then opened the road to the public and have steadily improved it over the years. The road is now fully paved and open year round. Travelling north The Great Trail passes through the historic town of Watson Lake, where the trail winds down approximately 20 km of local trails. Watson Lake first registered 18 km of main line Trans Canada Trail in 1999, and has since been working to expand and improve the trail in that area. Back on the Alaska Highway The Great Trail continues northwest, through the community of Teslin, and into the beautiful Southern Lakes region of the Yukon. Here, it turns and follows the Tagish road though the community of Tagish and onward to Carcross. Situated in traditional Carcross-Tagish First Nation territory, this area of the Yukon has a rich history and is now a popular recreational destination for many Yukoners. Carcross now serves as the end of the line for the famous White Pass and Yukon Route railway, and the surrounding area is home to mountain bike trails that have been recognized as some of the best in the world. From Carcross The Great Trail follows the South Klondike Highway north into Kwanlin Dun First Nation territory to the City of Whitehorse, the capital of the Yukon. Whitehorse is a bustling, vibrant city situated on the banks of the Yukon River, with a population of about 27,000. It is the largest city in the Yukon (approximately 75% of the Yukon’s population lives in Whitehorse and the surrounding area) and it serves as the main hub of transportation, services and government for most of the Yukon. Shortly before arriving in Whitehorse city limits the trail leaves the highway and winds through some beautiful narrow forest trails with excellent views of Cowley Lake and Mary Lake, and also occasionally follows the old White Pass and Yukon Route railway in this area. Near the Wolf Creek crossing travelers will find themselves on the Copper Haul Road, the main line of multi-use trail for much of the Whitehorse area. The Copper Haul Road was originally constructed in the early 1900s as a spur line of the White Pass and Yukon Route railway to service several copper mines in the area, and when the last copper mine was closed in the early 1980s the road was recycled into a multi-use recreational trail. For more information on the Copper Haul Road please visit our Copper Haul Road page. An alternative route through Whitehorse is the non-motorized Millennium Trail, a beautiful urban commuter trail along the banks of the Yukon River through the heart of Downtown Whitehorse. The Great Trail rejoins the Alaska Highway at the north end of Whitehorse, then turns and follows the North Klondike Highway. A short distance up the North Klondike Highway The Great Trail once again leaves the highway, and joins the Dawson Overland Trail. This portion of the Dawson Overland Trail is a remote wilderness trail stretching from the Takhini River approximately 100 km north to Braeburn Lodge. For centuries, the only way to get from the southern Yukon to the Klondike area was via the Yukon River. Summer travel required skill due to the fast current and a variety of rapids, and winter travel was extremely limited due to dangerous ice conditions and bitter cold. In 1902 the Yukon government contracted the White Pass and Yukon Route to construct a winter overland route, which was both shorter and safer than using the river. The Dawson Overland Trail has long since been replaced by the North Klondike Highway, but the Takhini River to Braeburn section remains open as a recreational trail. For more information on this section please check out our Dawson Overland Trail page. At Braeburn Lodge (home of the world famous gigantic cinnamon buns), The Great Trail rejoins the North Klondike Highway and continues north through the traditional lands of the Little Salmon/Carmacks First Nations and the Selkirk First Nations, passing through the communities of Carmacks, Pelly Crossing and Steward Crossing. The trail then takes a detour to the Village of Mayo. Situated in the traditional territory of the Na-Cho Nyak Dun First Nation, Mayo is located in a beautiful area of central Yukon and serves as a hub for a variety of tourism and mining activities. Near Downtown Mayo, The Great Trail follows the Prince of Whales multi-use trail along the Mayo River. Back on the North Klondike Highway, the trail proceeds northwest into Tr’ondëk Hwëch’in First Nation territory, home of the famous Klondike Gold Rush. The Great Trail leaves the North Klondike Highway approximately 50 km south of Dawson City, and follows the scenic Ridge Road Heritage Trail through the heart of the Klondike and down into Dawson City. Modern day Dawson City is a unique town, absolutely packed with visual and verbal history while at the same time home to a surprisingly vibrant and diverse community. The town’s economy thrives on both tourism and the variety of gold mines still operating in the area. Once in town, The Great Trail follows the dike along Yukon River and Front Street through the historical Dawson City waterfront. After Dawson City the Great Trail goes a short distance south on the North Klondike Highway, and then turns and joins the Dempster Highway. The Dempster Highway is a gravel road stretching over 400 km from the Yukon’s Klondike Gold Fields to the communities of the McKenzie River delta in the Northwest Territories. The Dempster Highway is situated in one of the most remote areas of the Yukon, has limited services, little traffic, and is a land of extremes. It is the only highway in Canada that crosses the Arctic Circle, and although a year round highway it is often closed for days at a time during winter due to dangerous weather and road conditions. It is also one of the most beautiful highways in the country, passing through two spectacular mountain ranges, black spruce forests, wind swept tundra, and across multiple major rivers. Bigtime wildlife and unique plants are abundant along the way. 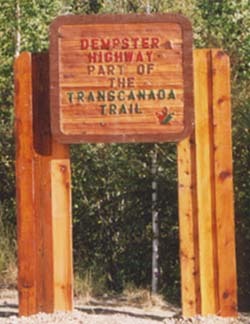 In 1999 the Klondike Snowmobile Association and the Yukon Territorial Government signed an agreement to designate the Dempster Highway as Trans Canada Trail, thus connecting the Yukon portion of The Great Trail to the N.W.T. portion, making a true coast to coast to coast route possible. The approximately 1,600 km of Trans Canada Trail in the Yukon is now 100% connected, but connected doesn’t mean finished. As in many other parts of Canada, work continues on the Yukon portion of The Great Trail as we maintain, upgrade and improve The Great Trail. If you are interested in getting involved, contact us today! For more information on the Trans Canada Trail, please visit https://thegreattrail.ca. To help support the Trans Canada Trail, please check out our T.C.T. Donation page and our K.S.A. Volunteer page.